According to the Coupon Industry Association of Canada*, in 2006, Canadians redeemed 100 million of 3.6 billion coupons available. Canadian consumers that did redeem coupons saved over $134 million dollars. This sounds like a lot of coupons redeemed, but when you calculate the amount of unredeemed coupons it is astounding. With an average face value of $2.02, the amount of unredeemed coupons is approximately $7 billion dollars. Some reasons why Canadians do not redeem coupons? Coupons are not for all consumers. There are several reasons why consumers do not use them. Cutting them from magazines or newspapers, printing them from various websites like, Grocery Alerts , or sorting them from the mail is time-consuming. It takes time and effort to clip coupons and organize them. Having to carry them to the store is too much of a hassle for many shoppers, whether they save a few dollars or not. Most consumers could not be bothered. Another possible reason why some Canadians might not redeem coupons is that they might spend more money. A coupon’s purpose is to entice shoppers to try a new product. Some consumers are brand loyal and do not wish to switch brands to save some money. The discipline required to not spend additional money may be lacking from some shoppers. When I was a teenager and went grocery shopping with my mother, I always saw the people that redeemed coupons and I perceived them as being “cheap.” The possible embarrassment or being labeled as “poor” or “cheap” is why some people don’t use coupons. The stigma attaching to using coupons probably still remains, especially at long lines at the grocery store when someone is trying to redeem double coupons. However, the recent recession has changed the general public’s mind when it comes to redeeming coupons. In tough economic conditions, families are forced to stretch their budgets further. This includes redeeming coupons on everything from oil changes to clothing stores to laundry detergent. Thanks to the Internet, several grocery stores (Real Canadian Superstore, Save-on-Foods, Safeway Canada) have added coupons to their websites and new websites have propped up to aid in gathering more coupons. The fact that more and more merchants are offering coupons shows the demand for them. Personally, I carry a grocery coupon binder (just a simple tupperware container), that organizes all my coupons into different categories for easy redemption. I have had terrible experiences at stores explaining that they do not accept photocopied coupons and when you inform the cashier that they came from a retailer’s website or from our website, it does not make a difference. Speaking with the manager at the local Save-On-Foods if the coupon came from the retailer and that it has a valid bar code, a valid expiration date, and a valid Canadian redemption address they typically redeem the coupon. This is something to look out for if a cashier or merchant ever refuses to take your coupon. Just explain that the printed coupon has everything they need to redeem. It is not a lot of money saved typically, but I do find the coupons add up when you combine them when an item is on sale. Here is a recent transaction. This copy of the receipt shows that I saved 75 cents off the Glad Wrap. This does not sound like much money, however, since the item was on sale at $2.99 using the coupon saved me an additional 25% off the sale price. How do you tend to use coupons? Do you find them more hassle then the savings? 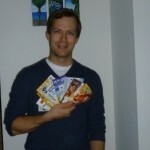 Author’s Bio: The author is Steven Zussino, Founder of Grocery Alerts Canada (http://www.groceryalerts.ca/) – Home of grocery deals and money saving coupons. He enjoys personal finance and saving money in beautiful Victoria, BC. GlobeInvestor Special Offer and Weekend Reading! My wife and I are big coupon users. But we ussually wait for something to also go on sale to use the coupon and then stock up. Recently we got healthy harvest pasta for 74 cents by combining a coupon with a store sale. sometimes our coupons will go unused, simply because we don’t need the product they are trying to sell on the coupon. or the coupon will expire before we find a sale to combine it with. Our coupon book is very organized and helps us match coupons to sales. we also sit aroudn on a saturday morning and compare flyers witht he coupons we have. I don’t mind if people think I’m “cheap” or “poor” I’d rather save a buck or two on the food we are purchasing. I purchased the same product (Catelli). I enjoy doubling up the savings by using the coupon and then using a sale or raincheck price! I agree with you about being organized. It doesn’t sound like a lot of money but the money adds up over the year. One way you can reduce the amount of unused coupons (either don’t use the product or not much savings) is to join a coupon club train. This way they don’t get wasted and the coupons are passed to someone else. I am actually starting this up on our website in the forums. At this point in my life, I don’t have enough time to use coupons as extensively as I would like. Right now, I pretty much stick to using coupons with a really high value, free product coupons, or coupons with a really long expiry date. If I happen to run across a lot of coupons for something that I buy anyway, I will also use those as well. In the future, if I have more time I will start to put together a coupon book to help me with expiry dates and spend more time at it. It can really pay off, but it doesn’t make sense for me right now for those reasons as well as others that I won’t mention here. I also recently got a great deal on pasta. I saw that pasta was on sale for 4 boxes for $5 which is already a really good deal at $1.25 a box and then sitting right on the boxes was a coupon to save $1 now. I ended up getting I think 16 boxes for 0.25 each. I thought that was pretty good! Not only that, but I used Shoppers Optimum points to pay for the purchase so I didn’t even have to pay the $2. The people over at SmartCanucks.ca are really good at using coupons to get things for free or almost free as well. It would be great to add Montreal to the website. We are currently seeking editors in additional markets in Canada including Montreal. We are planning on adding Calgary and Winnipeg this month. Winnipeggers LOVE coupons. We aren’t known as “wholesale city” for nothing….good luck with the site! Most people who read personal finance blogs redeem coupons (as the comments show). I don’t. Mostly because I don’t “sweat the small stuff”. I negotiate things like my rent, and if I’m travelling I’ll look for good airfare. If i’m making a big purchase like a new computer or some nice furniture, then I’ll shop around. But if my orange juice is going to cost $2 instead of $1? It’s such a small percentage of my total bugdet that it makes no difference compared to the real cost savings on the big items. I agree with your comment about the larger savings. This is from the iwillteachyoutoberich fame (i.e. ramit). I also try to negotiate my Internet bill to pay $19.99 instead of $35 / month. Including what Will said, it takes a mindset to want to save money and not waste. I’m an Executive Member at Costco and I can tell you that I use coupons A LOT at my local Costco. Grocery shopping not so much (unless the coupon is from a box or magazine). The majority of the coupons I use is for Costco where I do about 50% of my weekly grocery/staple shopping. b) I make almost everything from scratch and there aren’t a lot of coupons out there for eggs, milk, sugar, baking soda and flour. Interesting that you perceived people who used coupons as being cheap. I hope it’s not people’s worry about how others will perceive them that holds them back. I would use coupons if they saved me money on something I would normally buy anyway. It doesn’t bother me that others might judge me for using them. I don’t judge them for how they spend their money and I could care less what the person in line behind me thinks. Anyone have any tips for getting into the habit of using coupons? I want to try it more, but since I only rarely have one I use, I always forget about it. This means I either have to carry it everywhere I go until I get to the store and buy the item, or it means making several trips when I forget the darn coupon. While that number might seem shocking alarming, I don’t think it is. The fact is there is an opportunity cost for everyone when they are faced with coupons. Sure.. there are some coupons that have alot of great savings, but as lot of economists say.. there is no such thing as a free lunch, lets say there was a coupon for half price from a meal at a restaurant, sure you get the savings, but if the restaurant is out of your way you might be able to, but you won’t be willing to drive to that restaurant, and experience the added costs. In my opinion thats what happens… the opportunity cost for consumers is just not worthwhile to use most coupons. I use coupons but don’t go out of my way to find them. If they are hanging in the store next to the item I was going to purchase anyway, I grab a few. I keep them in a little Ziplock bag that I take to the grocery store once a week. If there’s an item an my list that also has a coupon I can use, great. if not, no big deal. I think making a list of the groceries you need and sticking to it will end up saving you more than impulsively buying items you didn’t neccesarily need because there was a coupon for it. If I’d use individual-product coupons I would probably save 5% of my grocery bill. I’d save about $35/month. The work needed for those savings is too much for me. I can see the usefulness for someone on an extremely tight budget. I use only coupons that are high value (like the $25 gift card or a similar free item – if you spend $250). The store where I do grocery shopping has those at the entry so it’s no additional work for me. Anyways the individual-product coupons would not fit my grocery shopping style. I tend to buy a lot of unprocessed items (like vegetables, fruits, fish) which usually don’t have coupons and I always have a shopping list based on the recipes that I want to make. I’ve had the same issue with coupons printed from companies website. It’s not worth the hassle of arguing with the cashier every week when they say we don’t take “internet” coupons. Surprisingly, I think the lack of coupon usage has more to do with Canadians not wanting to look cheap. It is the same reason that bartering is frowned upon in the western world. People are very proud and they don’t want people looking down on them. Personally I have no problem using coupons, but remembering to bring them to the grocery store is another story. I think lack of coupon usage is more to do with the fact that coupons are generally for things that people are not interested in. The coupons are a marketing tool used to encourage people to buy things. I’m not very good about collecting them myself, but when I come across one for something that I would buy anyway, I certainly use it. I don’t think coupons make people look cheap. I think the exact opposite, I think they make people look smart and organized. Would you go into a store and demand to pay full price when an item is on sale. If you have a coupon and you don’t use it, then that is effectively what you are doing. I get coupons from save.ca, and their various sub-sites. There’s usually stuff there that I’d buy anyway. I also use The Grocery Game to identify “rock bottom” sales, and to match coupons to sale items. I can usually save about 40%+ on individual items, and 25% or so off my total grocery bill. Coupons are friggin annoying. If you have a piece of paper we’ll give you 10% off. WTF! seriously just find the place with the lowest average prices and shop there. For me I believe that place is the Superstore, I get my $250 of groceries, I get a $25 gift card back and $2.50 of PC points. Also like previous posters have said, its cheaper to make from scratch than to buy prepared foods (even with coupons) and often the generics are cheaper than brand names with coupons. So in summary, coupons are only good for things you would have bought otherwise. The reason companies do anything, and hence why they make coupons, is because it makes them more money in the long run. More money for the companies means less for you (unless you’re a shareholder). First way you can save money is to not shop at Save on Foods… that place is a rip-off. Try Real Canadian Superstore. We use the odd coupon, but most of the things we buy don’t typically have coupons because they aren’t higher-priced name brand items which are horribly overpriced in order to offer you the “juicy” discount. When I was first convincing my husband of the value of using coupons, I asked him if he would take a dollar out of his wallet and throw it in the trash. An obvious “no”, but that is exactly what he would do if I had a dollar coupon for something we already used and he did not use the coupon. From there he has become even more fanatical than I, matching sales to coupons, doubling options, and internet coupon sites. We save quite a bit and our bank account reflects it. I’ve been re-thinking my answer to this one. I realized that it’s true that I almost never use coupons for grocery items because there are rarely coupons for ‘staple’ foods. However in the last week, I used a coupon for a haircut (20% off), Gap (20%), Old Navy (30% off), vitamins (50% off) and a buy one get one free entree! It turns out I do use coupons … generally just not grocery store coupons. Those are great coupons. On our site I try to post not only grocery coupons but coupons I find that are useful for clothes shopping or other tremendous savings. Vitamins is a great example to use coupons (brand name or private label still allows you to save money). We actually have “made” money by using coupons. The items were on sale for less than the value of the coupon! Once we got Shirriff brand Lemon Pie filling free and 0.01 back and another time there was a promotion with Oatmeal Crisp or similar cereal that had a 2.50 off coupon and it was on sale for 1.99- we just kept buying boxes and cutting the coupon off the box and made 0.50 each time! Not really that exciting but just illustrates the point. It seems that most people have focussed on coupons for grocery purchases rather than covering other goods AND services. Some coupons are for anything of a certain value (Sears, Best Buy often have coupons which are equivalent to 10% off based on certain levels of purchases going up to $100 off purchases totalling greater than $1,000). I would not be surprised that the young crowd is less apt to use “low value” coupons because of the time, effort and perception. Those who are retired and on fixed incomes would probably be high users of coupons. Personally, I have used coupons for a long time and never worried about perception (except, as mentioned, when ‘dating’ !). But, I also factor in whether it is cheaper to use a different but comparable product/service even without the use of a coupon. Finally, one should also factor in not just the cost of the savings but convert that into how much more money you would have to earn BEFORE taxes to realise the same benefit. Coupons are great if they are for items that you would buy anyway. But it’s easy to get sucked in and buy stuff you don’t need just because you have a coupon for it. I had a manufactuers coupon cut out from a box for a 2L of coke and it makes me sick having to argue with cashiers when they say oh we don’t take those! The way pretty much all businesses are cut throat to the max now days, it’s not very likely any of them are “giving” anything away for free. If they’re offering so much for free or reduced with coupon usage that tells me their profit margin on those items are considerably higher than they should be to start with. Watching shows like “Extreme Couponing” it’s cool to see someone get $800 worth of groceries for one cent, or $1400 worth for $44, then a rational person should think about how is that possible? Workers wages being cut left and right, people being laid off left and right, and these manufacturers or grocery stores are giving away thousands of dollars because someone cut a little piece of paper out of a newspaper or something? There is no such thing as a free lunch and you can be sure the consumer is paying for the coupon clippers windfalls one way or another.